Master bedroom: king-size bed, wardrobe, en-suite bathroom with hot shower and tub. Office space and roof terrace. Bedroom 2: king-size bed, aircon, walk-in wardrobe and en-suite bathroom with hot shower. Bedroom 3: Downstairs. Aircon, en-suite bathroom with hot shower and tub. Living just North of Town. Good access to big shopping malls, Tesco Lotus 2-3 min, British International school or QSI International School within 5-10 min, marinas (5-10 min) and airport (25 min). 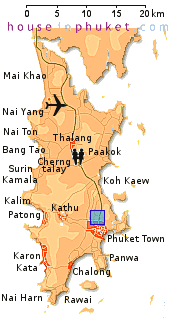 Tourist places (Patong i.e) are a 20-25 minutes drive. Western kitchen: gas cooker with hood, fridge, microwave, hot water. Private pool: 4.5 x 9 meter. Thai street North of the big Tesco Lotus in Town. Living room: sofa, TV, dining table and 2 aircons. Central hot water from boiler. Washing machine. Quality furniture in this private pool villa. Right out of bed, jump in the pool.